Place halibut in tin foil that has been doubled over and there is enough to wrap the entire halibut like you are enclosing it in a tipi. Squeeze the juice of one lemon all over both sides of halibut. Slice the remaining lemon. Place on tin foil in an arrangement that is the same size as the halibut. Slice the apple and place a top the lemon. Slice the other lemon and sit atop the apple. Now place halibut on top. Drizzle the extra virgin olive oil over the halibut. Crack the pepper and salt and then sprinkle over the halibut. Slice the two cloves of garlic and place atop the halibut. Sprinkle the parsley over halibut. Bring both sides of the tine foil together to form a peak over the fish. Seal the ends together -- so the foil is not touching the top of the fish. It’s kind of like a tipi around the fish. Place in a baking dish and place in the oven at 375. Remove from oven and pour the juice from tin foil into a sauté pan. Add the other one-table spoon of extra virgin olive oil into the pan. Once the contents begin to heat add the fish. Cook on either side for 2 minutes. Serve the fish with the sauce of the pan. I very gently massaged the sole with extra virgin oil an hour before I cooked the fish. I then squeezed two lemons over the sole sitting in the extra virgin oil and then added cracked black pepper, and sea salt. In the end I had too much fish for the amount of guests we had, so I froze a portion of the fish. I cooked it later and It was even better because it had absorbed much of the lemon and extra virgin oil. Once I began sautéing the fish, I added some cut up European parsley and some diced garlic cloves. I didn't want the garlic or the parsley to dominate the flavor of the fish, so I used it sparingly. Say half a bunch of parsley and just 2 or 3 cloves. I sautéed each piece of fish for only 90 seconds on each side. one cup of stock (chicken or vegetable). Start by prepping the oven for the pommel frites. Turn the oven onto 400. Boil the rustic potatoes for 5 minutes. Strain the potatoes and slice into fingerings (something most resembling fries). Place frites into a total of 2 baking trays. Massage 2 table spoons of olio into each tray of frites. Sprinkle with sea salt flakes infused with garlic and sea salt flakes infused with rosemary. Cook for 20 minutes and turn. Once they are golden brown on both sides -- which should be only another 10 minutes -- sprinkle half a cup of parsley over both trays of frites. Return to the oven for another 5 minutes before serving. As the frites cook -- prepare the mussels. Rinse the mussels under running warm water for 3 minutes. Soak in a pot for another 10 minutes. Strain the mussels and pour into a pot on the stove containing the white wine. Simmer for 10 minutes. As that simmers, sauté the three onions. Dice the onions and sauté in two table spoons of olio. Add 6 sliced up garlic cloves. Grind in plenty of cracked pepper. Once translucent pour the onions & garlic into a blender. Add half a sick of butter. Blend into a cream. Set aside. Add the other half of the stick of butter to the wine & mussels. Once it melts add the onion blend and one cup of stock. Cook over a medium heat until all mussels open. If they are Prince Edward Island (smaller mussels) they should all open within just another 10 minutes of simmering. Slice up 6 garlic cloves and sauté in one tablespoon of olio. Once golden brown pour the garlic and oil into the mussels. Slice the green onions and stir into the mussels along with the one cup of sliced parsley and the chili flakes. Stir in and simmer for another 5 minutes with frequent stirring. Serve mussels in a large pot with frites in a separate bowl. Place in center of the table and share with your company and enjoy your foodgasm with a fabulous wine. I baked the won ton crisps the night before -- which I recommend as it is allows them to cool and it's a slightly tedious process that you need to stay focused on it (as opposed to doing ten things at once which is my style). I cut the won ton papers in half creating two triangles. I brush them with sesame oil and the sprinkled them with salt, chili powder and Chinese Five Spice. I placed them in a hot oven (400 F) and they cooked within 4-5 minutes. I diced the tuna into blueberry size pieces. Once it was all diced and sitting in my mixing bowl, I squeezed lime and stirred with a fork. The citric acid is an agent of a chemical process called denaturation. In this process, the citric acid changes the proteins in the fish, unraveling the molecules and altering their chemical and physical properties. This process of denaturation is as though the fish has been cooked with heat. So, I do not over do the limejuice and I do not let it sit in the juice overnight (which would truly bring about the process of denaturation). 3 limes is just enough to give an ever so slightly 'cooked' effect (although technically not cooked). I like to add the garlic and ginger in next. This allows the tuna to become infused with these flavors. Soon after I stir in the chopped cilantro and the sliced green onions. I then massaged the sesame oil with my very clean hands. Again using a fork I stirred in the small amount of wasabi, mint and sesame seeds. 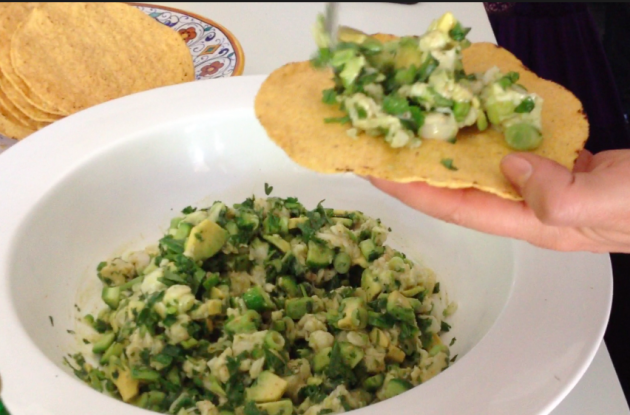 Lastly I added firm diced avocados and made sure not to over stir which would cause the dish to become like guacamole. I served a full teaspoon of tuna tartare on each won ton crisp. I like to serve this dish on a large tropical leaf with occasional orchards. I don't add wasabi or sesame seeds. I just squeeze 2 limes over 2 pounds of salmon, stir in 3 diced garlic cloves, half of a ginger root and finely dice, a splash (one quarter of a cup) of low sodium soy sauce, one table spoon of sesame oil, 10 finely sliced green onions, one bunch of finely sliced cilantro, and 3 very firm finely sliced and diced avocados. This can be served upon a crispy base (like a won ton crisp) or, like on this occasion, guests can help themselves to a large bowl of the salmon tartare and scoop it up with a rice cracker or a bagel crisp. This is super simple and a fab crowd pleaser. Place the tuna sit in sesame oil and soy sauce for about ten minutes before searing and slicing. As I let the tuna sit, I prepare my wasabi cream. Add 2 teaspoons of wasabi paste to half a cup of whipping cream). Stir with a fork until combined. I sautée the corn tortillas in a hot pan with extra virgin olive oil. I turn once one side is golden brown and then I halve. I place the 2 steaks onto a very hot griddle or BBQ and sear for 60 seconds on either side. I remove and place on a cutting board and slice long ways. 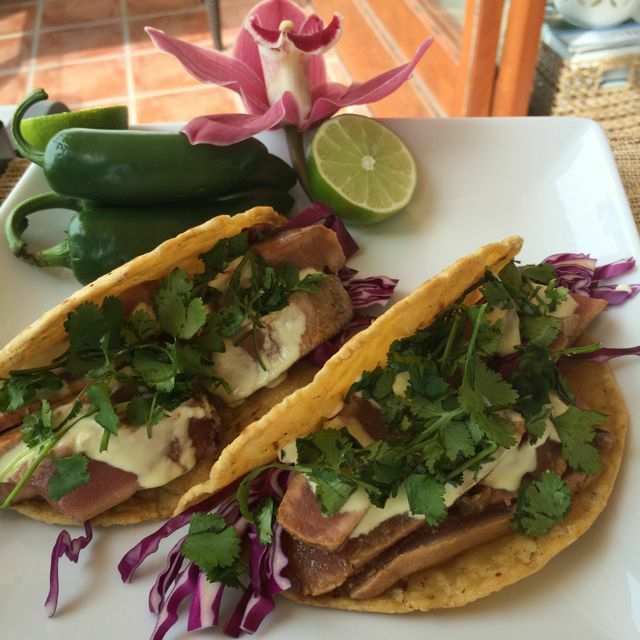 I lay the tuna pieces on a bed of shredded cabbage inside the taco shell and then drizzle a nice amount of the wasabi cream before placed cilantro on top.